I’ve been reading The Business Blockchain this weekend. It was written by AVC community member William Mougayar. This book started out as a Kickstarter project which I blogged about at the time. If you backed that project you will get a copy of this book. If not, you might want to get a copy on Amazon. I am not done with it yet, but the book makes a complex subject, blockchain technology, accessible for the non-technical. It also lays out some of the more obvious uses cases for the technology and explains how the blockchain technology market is evolving. 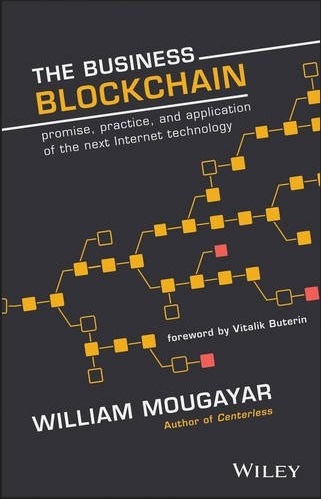 If you think you might want to start a business based on blockchain technology or if you think blockchain technology is going to reshape a market you are working in, or if you just want to understand this thing that your son or daughter is obsessed about, then this is a great book to read. I am also quite proud that the conversations we have had on this blog on this topic over the past five years have shaped William’s work and certainly had something to do with his interest and his growing expertise and reputation in this area. This blog community is a talented group and we have helped each other grow and develop. This book is just one of many examples of that.